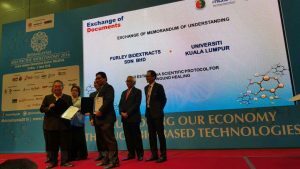 Industry players recognized UniKL MICET for being the technical provider and strategic partner with well-known institutions. We organize various programs with and for our partners both at academic and industrial levels. Technical provider for Bioengineering Application. Melbio is one of the main players of biotechnology here in Melaka. The Bioengineering Technology Section of MICET has been in collaborations with Melbio, where we send our students regularly for technical and industrial trainings. You Dun Chao Healthcare Products Sdn. Bhd. As the main producer of Daun Belalai Gajah (Sabah Snake Grass) herb for healthcare products, You Dun Chao has collaborated together with the Bioengineering Technology Section of MICET in performing R&D for the added value products of the herbs. Inno Bio Group of companies is the premier biopharmaceutical company set up by the Malaysian. The Bioengineering Technology Section of MICET had sent industrial training students to Inno Bio, and some had been absorbed as the permanent staff there. Researchers in Inno Bio also collaborate in some part of the research with us to improve processes. 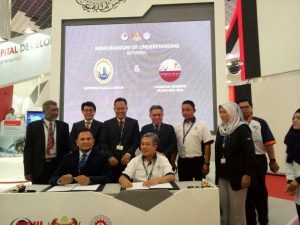 A memorandum of understanding (MoU) signing ceremony between Universiti Kuala Lumpur and Langkawi Cosmetic Island Sdn Bhd was held on 22nd March 2017 in Langkawi International Maritime and Aerospace [LIMA 2017]. The ceremony was signed by Dato ‘ Professor Dr Mazliham and Mr. Tajul Azman Dato Hj Ahmad Tajuddin representative of Langkawi Cosmetic Island Sdn Bhd; witnessed by Dato Hj Mohd Rawi, Kedah State Exco and Dato Adham Baba, Chairman of Universiti Kuala Lumpur. 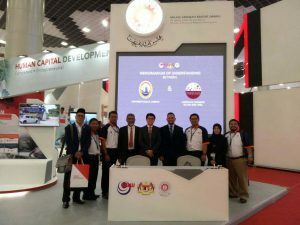 Delegation from UniKL MICET was led by Dean – Assoc. Prof. Dr. Ahmad Naim b Ahmad Yahya and D. Dean Industrial, Institutional and International Partnership (IIIP), En Muzafar b Zulkifli, Dr Sharifah Soplah bt Syed Abdullah, En Mohd Syazwan b Mohd Ghazali and En Mohd Hafiz b Nordin. Kolej Kemahiran MARA Lenggong – technical provider for Syllabus Development. Top Fruits Sdn Bhd (Production of durian wood biochar and application in nursery). Asian Resinated Felt Sdn Bhd (Biochar in nonwoven composite for accoustical application). HALAL conference collaboration with Universitas Muhammadiyah Mataramn. Knowledge transfer and Halal collaboration with University College of Technology Sarawak. Food Product Development Talk by Farm’s Best. Sharing session with AB MAURI.